APA recommends using 12-point Times New Roman font. If you are not using Times New Roman, then use another serif typeface for readability. Only use a different typeface in figure descriptions to add style to the paper (section 8.03). Use double-spacing throughout the entire paper. To add double-spacing in Microsoft Word, highlight all the text you want double-spaced, and then click on Page Layout. Next to the word Paragraph, click on the arrow. Under Spacing, Line Spacing, select Double and then click OK. Put one space after the period for each sentence in the body of the paper unless you are specifically instructed otherwise (section 4.01). Do not insert a space after internal periods in abbreviations (e.g., a.m., i.e., U.S.). Leave 1-inch margins from top to bottom and side to side. 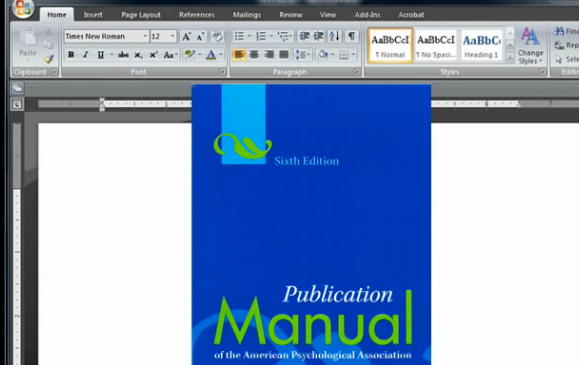 Microsoft Word usually is set to 1-inch margins. You can check this by clicking on Page Layout; then click on Margins. The margin you are using is highlighted; select Normal if it is not already selected. Finally, we begin to type the paper! The full title starts it off at the top center of a new page. For the rest of the paper, you only need the title and page numbers in the header. Remember to cite your sources.